Hotel de la Ville celebrates 60 years and, like all important birthdays, has decided to celebrate to the fullest, taking advantage of the long-awaited inauguration of the veranda of the Derby Grill, the award-winning restaurant that is the undisputed realm of Chef Fabio Silva. Here is all the information necessary to participate in an evening that promises to be unforgettable. All ready for September 8! We await you on Saturday, September 8, from 19:00 to 24:00, in Via Cesare Battisti 1, in front of the splendid Royal Villa of Monza, for an inauguration dinner party of what we are sure will become the most popular winter garden of the city. 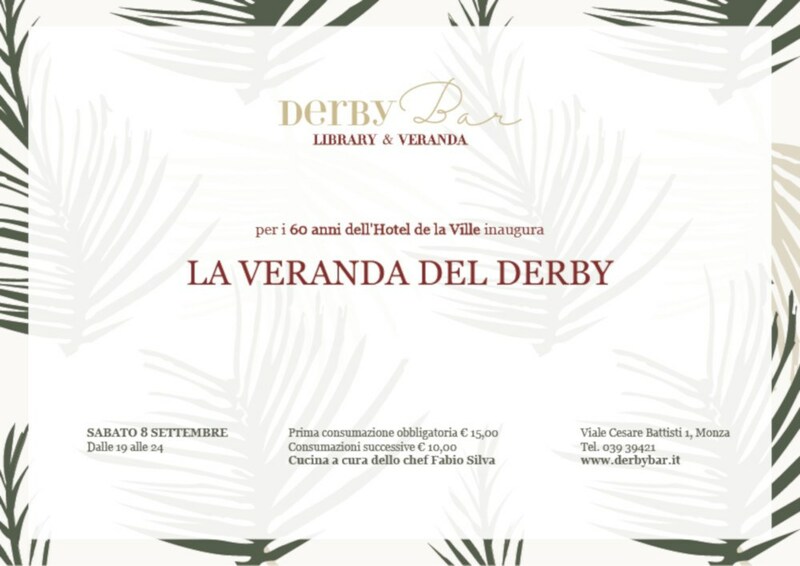 Hotel de la Ville’s birthday will be held on the premises of the Derby Grill, the Derby Bar and, of course, the new veranda, from which you can access the outdoor areas of the Hotel. Enjoy the refined finger food of Chef Fabio Silva. Sip cocktails and enjoy aperitifs mixed by bartender Carlos Rosa. Create your own “custom” gin and tonic, choosing between several gins, tonic waters and toppings. With the notes of the Dj set floating in the background, our guests will have the opportunity to admire the new veranda, with large and bright windows: a wonderful outdoor space that can be used all year round, air conditioned and climatised. There will also be a social corner, where you can take your souvenir photos of an evening that promises to be mind-blowing! Let’s discover together the new veranda! The walls are decorated with paintings by Giovanni Bressana, drawing inspiration from the luxurious vegetation of the exterior, and act as a counterpart to the frescoes of the Derby Grill, with equestrian motifs inspired by the Derby Cross Country race that took place in the Monza Park in the 19th century. The rooms are decorated with bamboo, the chairs are from Henryot & Cie the most exclusive supplier of hotel furniture in the world, the tables have themed pedestals with ceiling fans and evergreen plants as the final touch. The large windows allow our guests to feel always outdoors, in the middle of winter when temperatures are cold and at the height of summer when the heat doesn’t seem to stop.